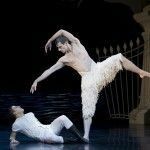 Matthew Bourne’s audacious Swan Lake has in its 18-year existence collected over thirty international awards, enjoyed four wildly successful UK tours and has become one of the longest-running ballets in the West End. No small feat for a bold, contemporary reinterpretation of one of ballet’s most-loved stories. Bourne presents an accessible, vivacious and enjoyable Swan Lake – one that is reflective of the times and appealing to audiences of all ages and backgrounds. Before taking my seat at the Sadler’s Wells Theatre I had fallen victim to a few common misconceptions about Bourne’s ballet-influenced production. First, the cast is most definitely not “all-male”, as conversations with colleagues and friends leading up to my visit had led me to believe. Second, the production is technically not strictly ballet, but rather a contemporary dance/theatre production. The common misconception of an “all-male” cast evokes notions of men in flamboyant, feathery drag (which couldn’t be further from what is presented) and is derived from one of the production’s boldest offerings: not an all-male general cast, but a virile, all-male group of swans, distinctly masculine and visually captivating in both casting and costume. The replacing of the female corps de ballet is the most obvious, and enthralling, deviation from the original Swan Lake. Contemporary dance productions often lack one essential component: accessibility to a diverse audience. They often require some level of critical understanding and awareness – and while in the case of Bourne’s production a critical awareness of both ballet and contemporary dance would enhance the impact of the performance, it is in no way essential to the experience. The production is spectacular to say the least, which with its reputation is to be expected. Tchaikovsky’s exquisite score, which Bourne has adapted by re-ordering certain numbers and omitting others, merges seamlessly with the contemporary choreography, particularly in Act 4, where the choreography transitions from classical ballet to modern dance integrated with definite jazz forms. As a classically trained musician, I have encountered Tchaikovsky’s score at various times, and this interpretation is beautifully communicated, complementing the modern visual elements of the production superbly. Bourne focuses the production on the Prince (Simon Williams) and his longing for liberation, love, acceptance and comfort. Williams dominates the stage with a mature confidence while balancing his performance with grace and vulnerability. 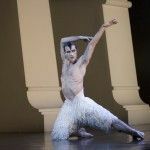 Jonathan Oliver, the lead swan, majestically engages with Williams, tackling the themes of love and betrayal with a mesmerising form and technique in his dancing. His charisma and fine physical form feed the sensual eroticism that oozes through the choreography and dance sequences between the two. Michela Meazza dances the role of the Queen with the authority, majesty and grace that the role demands, but the Queen at times feels somewhat forced and lacking in a human element that is so vital to the production. As a whole, the ensemble is captivating and their chemistry fluid. Most notable, of course, is the group of swans, which collectively carry the production and audience through a spectrum of emotions. The minimalist set and props set the stage beautifully. The props form the backdrop to the production without drawing attention from it. Lighting is used with dramatic effect and the use of spotlights and shadows cast by the dancers is incredibly effective, visually capturing and enhancing the emotional elements of the production. The costumes, particularly those created for the group of swans, enhance the distinct masculinity of the dancers, while also capturing the beauty of the swans. These two elements are interpreted into beautiful yet ultimately masculine feathered high-rise, three-quarter-length shorts. The production doesn’t seek to dictate an absolute storyline through the dance and choreography, which could feel confusing, especially to an audience that may not be familiar with the myth behind and the themes explored in the original Swan Lake. I struggled to follow the storyline, especially during Act 1, and this distracted initially from the beauty of the performance. I decided to simply enjoy the production and leave interpretation to later, allowing me to appreciate the production as I watched. To a first-time audience member, the production may feel more like an abstract emotional exploration, with interwoven scenes that don’t seek to impose, or indeed attempt to provide with certainty, any specific storyline. Perhaps this is Bourne’s intention: to allow an audience to interpret his production and the scenes within in whichever way they choose. Bourne regularly reworks, updates and reviews his production, ensuring that it grows and develops with the times. Every element of the production seems to merge seamlessly together to create a truly breathtaking experience – an experience that feels like a culmination of tremendous passion, dedication and commitment on the part of Bourne and his superb cast and crew. The production really speaks to its audience, carrying them on an emotional journey and capturing their attention from start to finish, culminating in a breathtaking finale that leaves the audience aghast. Bourne’s Swan Lake is a truly exhilarating experience. Matthew Bourne’s Swan Lake is at Sadler’s Wells until 26 January. Ticket office: online or 0844 412 4300. An MA Journalism student at Birkbeck, I am passionate about writing and human communication in its many different forms. SInce graduating from University of the Arts, London with a BA (Hons) Journalism degree in 2011, I have worked on the editorial teams of a number of publications, including Schon! Magazine, QX Magazine and, most recently, Vice Magazine. I'm a creative. I have an enquiring mind. Words fascinate me almost as much as people do. Aptly, my favourite hobby, after writing, is people-watching. I was born, raised and schooled in South Africa - and moved to the UK in 2007, for what was originally supposed to be a "gap "year. But, if you tire of London, you tire of life - so I'm still here, and I'm still in love with London.